Over the years, our trusty Honda Element has taken us on countless backroad trips from National Park hopping in the scorching Utah heat to bone-chilling cold nights at Crater Lake. The spacious interior allowed us to easily sleep inside on our favorite forest roads, eliminating the need to find hotels or book hard-to-get campsites. However, sleeping in sleeping bags on thin sleeping mats, with no shower, and no convenient way to store cold food often left us a bit eager to get back to civilization. So we set to work and over two week time of non-stop runs to Home Depot, screwing, sawing and drilling we were able to complete our DIY car conversion project. 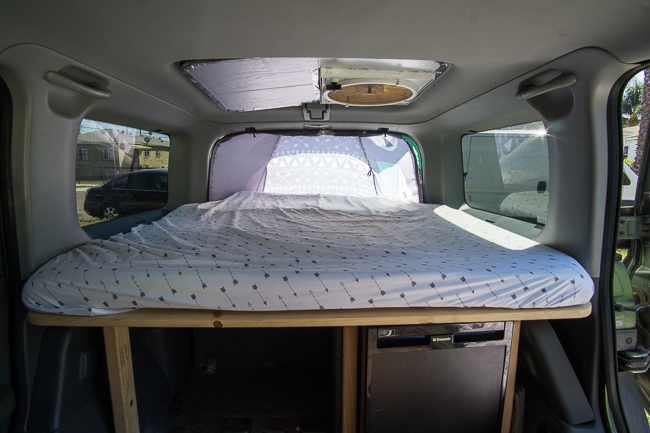 After finishing the conversion, our SUV is now equipped with a foldable sleeping platform, a full-size bed, tons of storage, a fridge, a fan, and even a solar shower! Based on these requirements we came up with a general design of what the conversion layout should look like for our Honda Element. Once we had a general layout figured out, we took measurements and made sure everything fit in our car like the mattress and the fridge. Then it was time to get to work and start building! 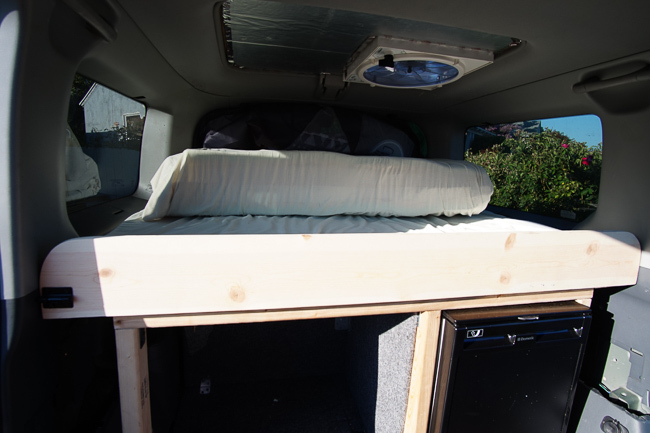 One of the trickiest but most important steps of the small camper conversion was creating the SUV bed platform that fit a full-size bed on it. We wanted our camper bed to be comfortable but not take up too much space. 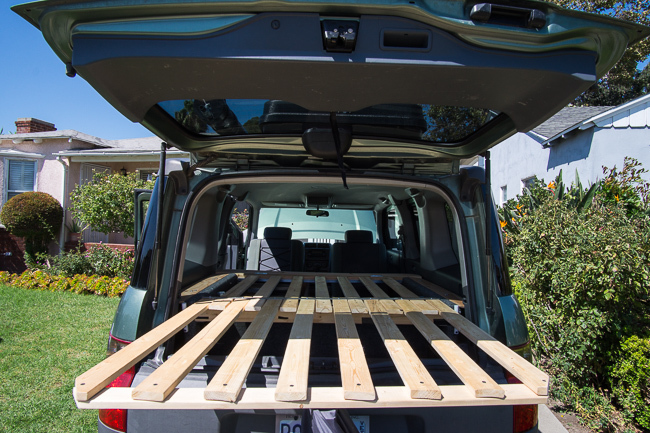 For our conversion, we decided to create a bed frame that fits in the back of the car during the day and extends out for sleeping at night. We also wanted to install a fridge underneath the sleeping platform so we had to take that into consideration as we built the bed frame. We created a general bed platform from wooden beams and added aluminum bars as guides and support. The idea was to keep half the wooden beams in place and the other half set up to slide out and support our feet while we sleep. We used a metal bar as a guide to slide out the wooden slats and a wooden beam at the end to keep them together. A metal rod was added in the back of the car underneath the platform to support the extended wooden beams at night. 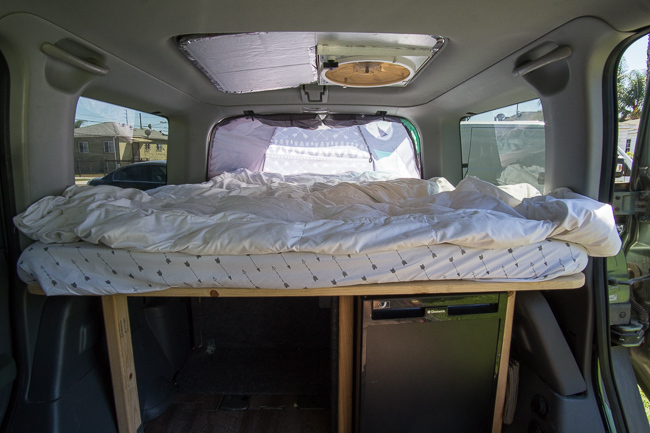 Inside the car, we added a 1×6 to keep the mattress from sliding forward during the day and to add extra length at night on the sleeping platform. We added a gate lock to keep the flap up and in place during the day. 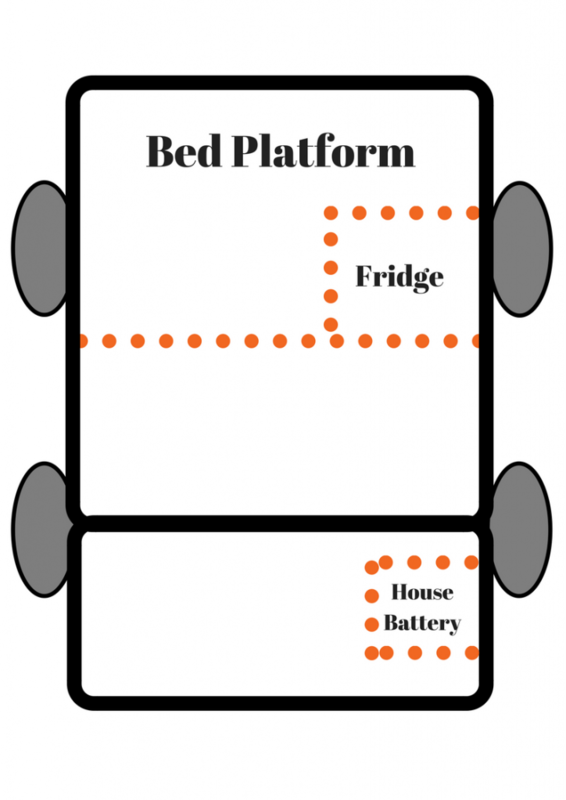 Once the bed platform was built we bought a 4 inch full-size memory foam mattress on Amazon. It was the perfect thickness because it is extremely comfortable without being too thick. Our Honda SUV is not perfectly square so we had to cut the mattress to fit the shape of our car. 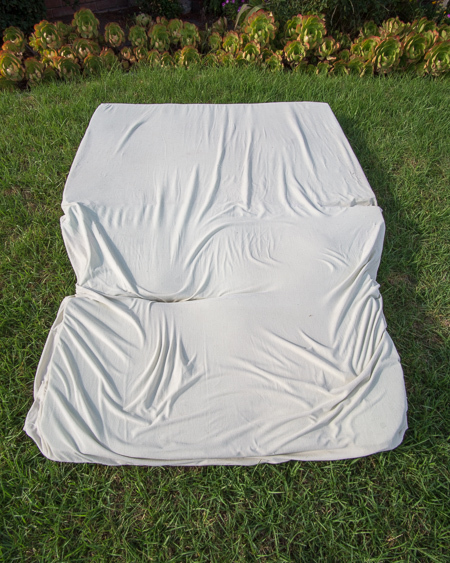 We also cut the mattress in three parts and sowed them loosely together through the mattress cover sheet so we could fold the mattress during the day. We used a blanket and these bed sheets and pillowcase for a twin size bed. We wanted something to cover the extended bed platform at night to provide more privacy and to protect us from bugs or bad weather. 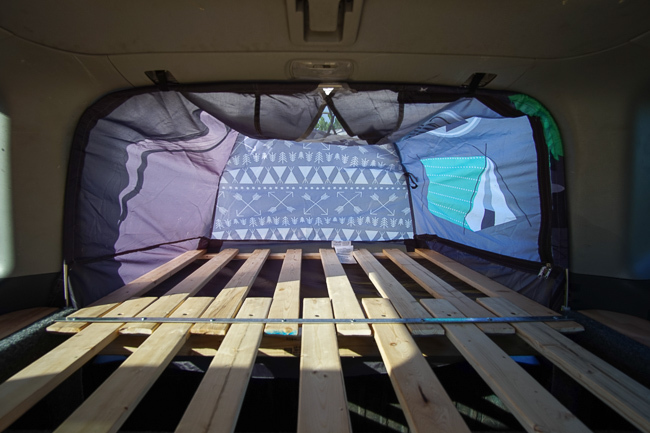 We used a small kids tent from Walmart to create a custom cover in the back of the car that extends out at night along with the wooden slats. We sowed it into a shape that fit snuggly around the car’s frame and the wooden beams. We used tent rods, hooks and velcro to keep the tent upright at night. 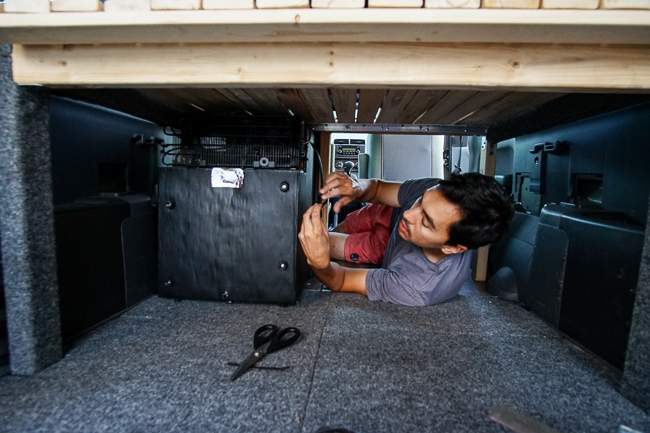 During our Honda camper conversion we wanted to install a small fridge and a fan in our car so first we had to add an extra house battery and wiring to power up these additional features. 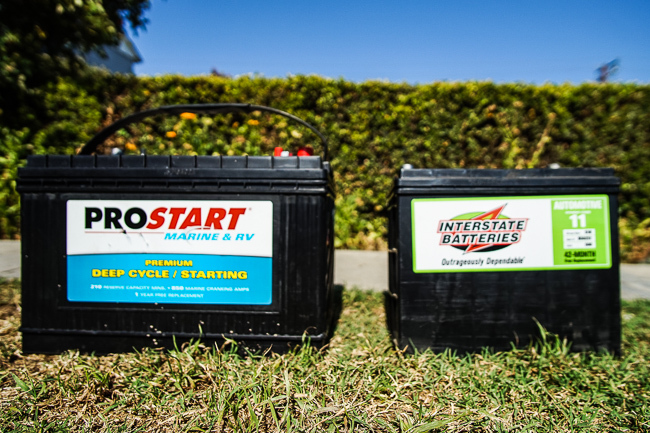 We used a Pro Start Marine & RV Deep Cycle battery from Pep Boys. We moved the regular battery a few inches back and added the new house battery in front of it. 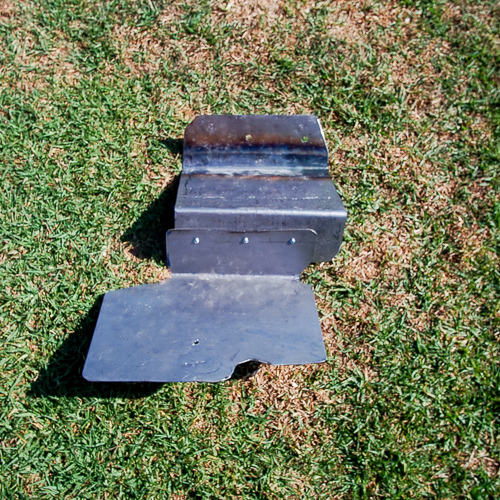 We bolted both batteries to a custom stainless steel plate to hold them into place. A Battery Isolator Relay was installed to charge both batteries from the alternator when the car is running, but separate them when the car is off to make sure we don’t drain the starter battery and get stranded in the middle of nowhere. This worked out great and was super easy to install. One of our must-have items for our camper conversion was to install a this Dometic high-efficiency 12V fridge in our SUV. This would help us keep healthier eating habits and avoid restaurants and fast food which means more savings in the long run. We had to consider the fridge parameters as we built the bed frame. We wanted the fridge to fit under the bed frame and the mattress to sit on top of it. We had to place the fridge in the car before we secured the bed frame to the floor. 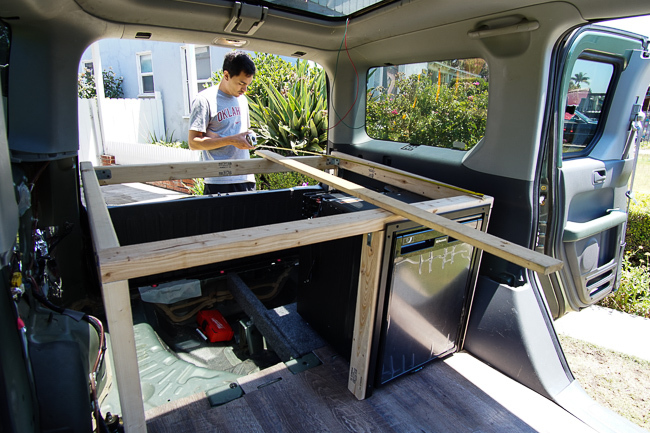 Once the fridge and the bed frame was secured to the car’s floor, we ran wiring along the sides of the car to power up the fridge. 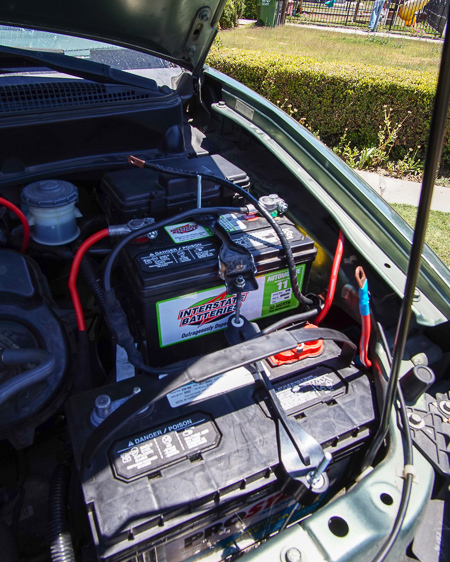 The extra house battery can provide enough electricity to power up the fridge as long as the car runs for a minimum of 15 minutes a day. 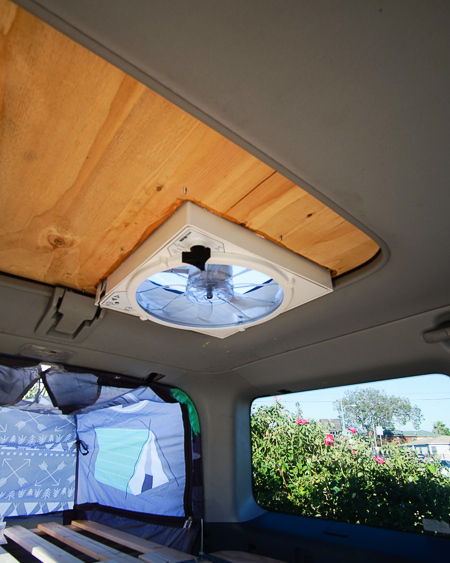 We decided to install a ceiling fan into our Honda Element’s sunroof to alleviate some of the heat during the hot summer seasons. We used this rooftop RV fan from Maxxair, which is great because it comes with a thermometer that you can set to turn on automatically when it gets too hot inside the car. In order to install the fan in the roof, we replaced the sunroof with a piece of wood. Then we cut a hole in the wood the size of the fan. The outside part of the wood was sealed with varnish so water can’t get in. Then we transferred over the hinges from the sunroof to the wood piece to secure the wood piece on the roof. We placed the fan in the hole and screwed it into the wood, making sure to add some caulking to the screws so water wouldn’t get in. Then we transferred the finished wood piece and fan onto the sunroof and secured in with the hinges. 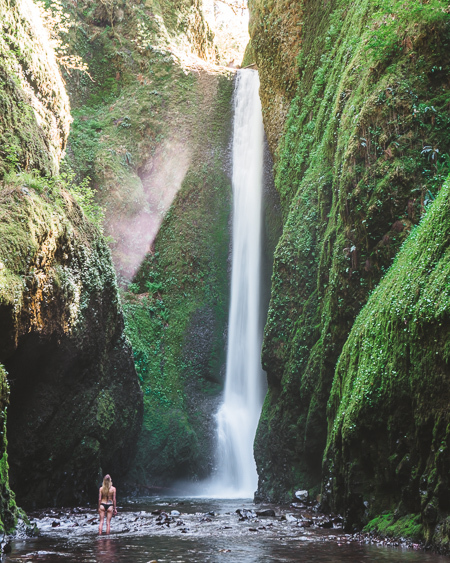 One of the hardest parts about traveling in a camper car is finding a place to take a shower. 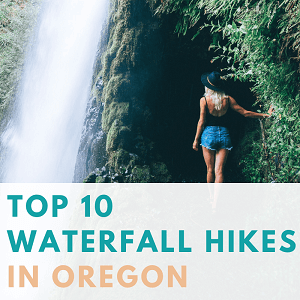 Wet naps and dips in the river are very scenic but can only go so far. Sure we could pay $10 for a day pass at a gym, but we’re all about saving money where we can. 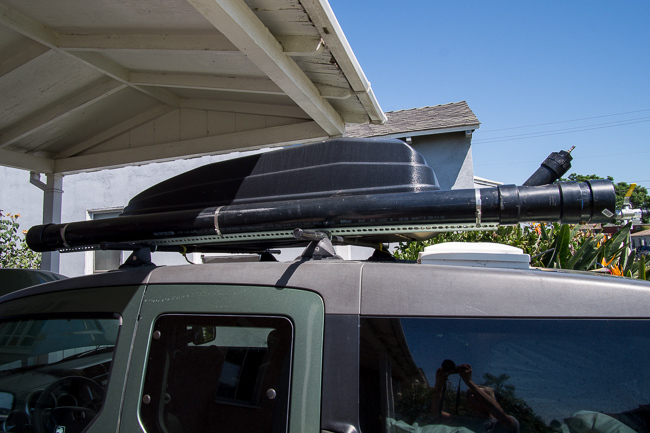 So instead we decided to create our own custom build solar shower kit out of black PVC pipe from Home Depot. 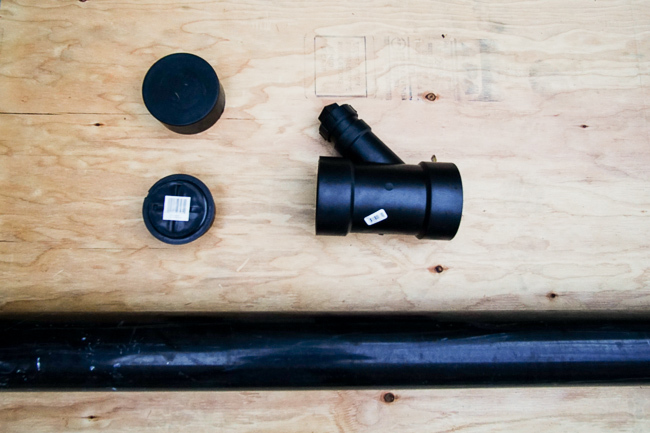 We chose a black pipe because black color heats up water during sunny days and keeps the water warm. We added caps on both sides to keep the water in the pipe and a Y-joint to fill it up. At the very top, a Schrader valve was added so we could add pressure with a car tire inflator. At the end of the shower, we added a ball valve to the end cap and attached an RV Shower Hose when in use. When not in use, we simply close the valve and remove the hose. 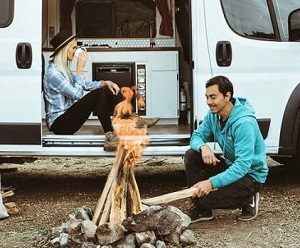 While traveling in an adventure van looks glamorous, not everyone has the luxury and time for a campervan conversion. Sometimes we just have to make the best of what we already have. 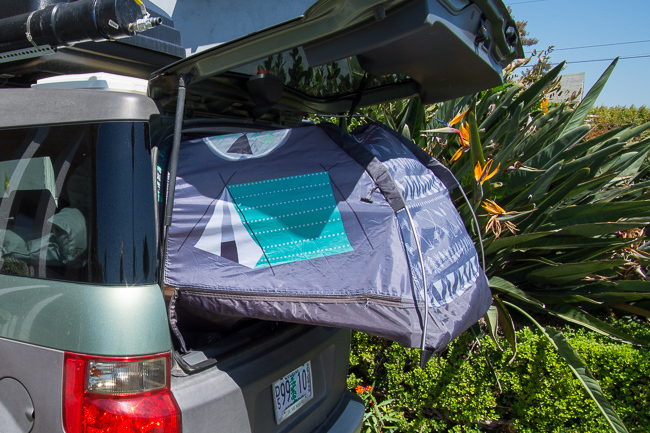 An SUV might not be as roomy as a van, but it still has a lot of space inside that can be utilized for sleeping and storage. 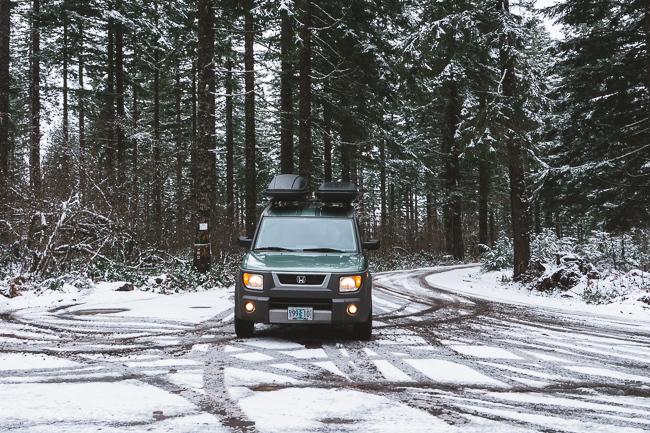 The best part about converting your 4×4 or an all-wheel-drive car into a camper car is that you don’t have to worry about your car getting stuck on rough roads and unlike a van, you can take it on just about on any trail or small road. But if you do decide to go with a campervan for extra comfort, here is our guide on how we converted an empty Promaster van into a full-time campervan. 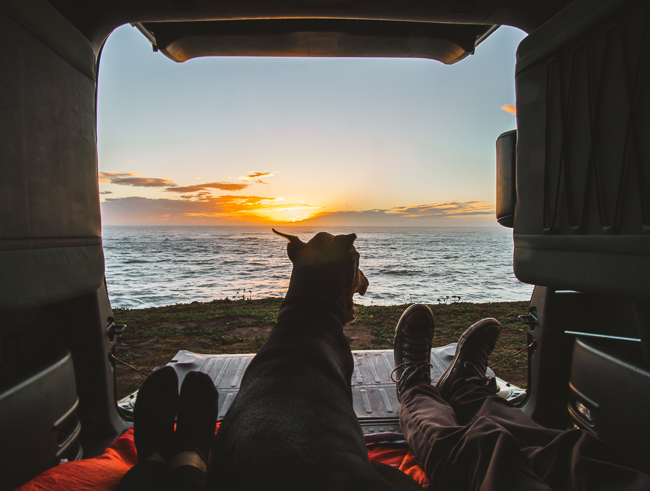 If you are thinking of converting your SUV into a full-time camper, here are some rough estimates of the time and money it took. Estimated conversion time: 2 weeks working on it every day, about 100 hours. Converting your car into a camper vehicle is the cheapest and most convenient way to travel around. And by following these 8 steps you too can convert your everyday SUV into a full-time camper car! This post may contain affiliate links, please read the disclosure for more info. Thank you for reading! Nice! I’m converting my element as well, it’s always I interesting to see the different approaches people take. Just wanted to mention the toxicity of pvc leaching into your shower water. Safe travels! Thanks for your comment! Hopefully, this article gave you some good ideas for your conversion as well. We are aware of the pvc leaking, so we are only using that water for showering. We use bottled or filtered river water for drinking and dish cleaning. Good luck with your project! 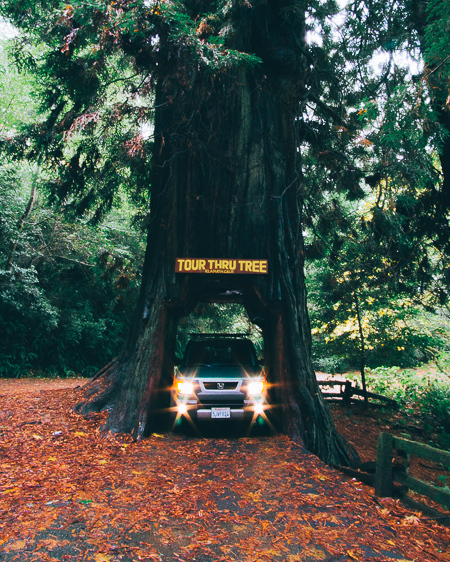 Awesome, we have a Subaru Forester I would love to do this to… Are these fixtures all permanent? I couldn’t really tell. If we did this would it be a lot of trouble to change back into our regular car? These fixtures are not permanent, they can all be reversed back to their original state. We actually recently sold our Honda SUV and moved on to a van conversion project. The day we sold the Honda we converted it back to its original state in about 2 hours. If you do decide to convert your Subaru and have any further questions, don’t hesitate to ask! Nice job. I’m looking to do this to my Prado Landcruiser but don’t quite understand how you made the sliding bed. Do you have a more detailed description or drawing you could share that would show the make, model and length of the rails you used and how they were placed etc..? Thanks. Hi John, the storage area behind our fridge became our kitchen. The area was the perfect depth for our camp stove and we used a medium plastic container to store our camp pots, utensils, and dry or canned foods. 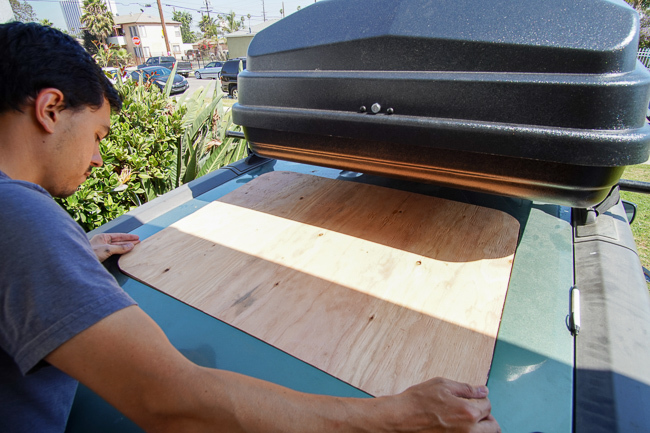 Since the Honda Element has a two part rear door, the lower tailgate was used as a kitchen and cooking table and the top liftgate protected us from the elements while cooking. Wow! You guys have some serious amenities in your conversion. I converted my own Element in November, I think it came out quite beautifully and functionally, but lacks the refrigerator and shower and other things of that nature. Wow, great job on the conversion! 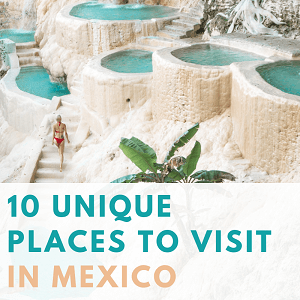 Super impressive! The fridge was a must for us so we built the base of the bed around it. It definitely helps save money on food and stay healthier with eating habits. 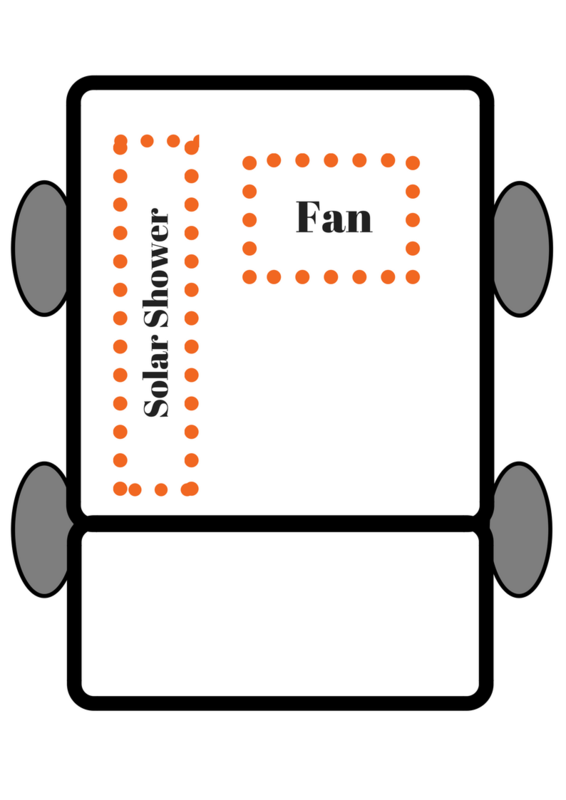 The solar shower is great to have but you can also buy a solar shower bag on Amazon and those work equally well. I just bought an Element and I am so excited by the possibilities! 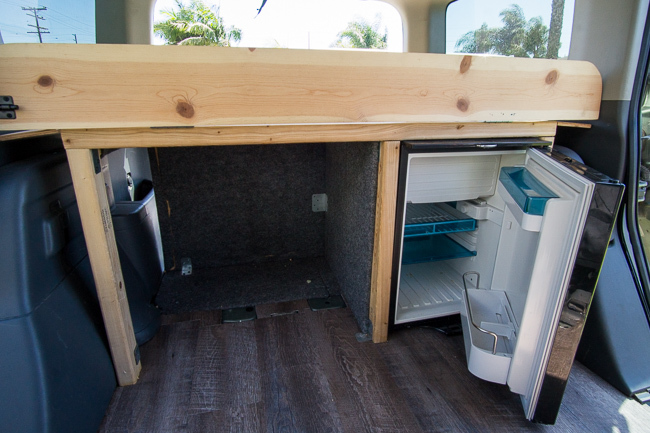 I just bought an element with the intention to convert it, How do you affix the fixtures (bed, fridge, etc) to the floor so that they do not move around as you drive? On the front of the bed frame, we took out the rear seat belts and attached the frame to the bottom seat belt mounts. 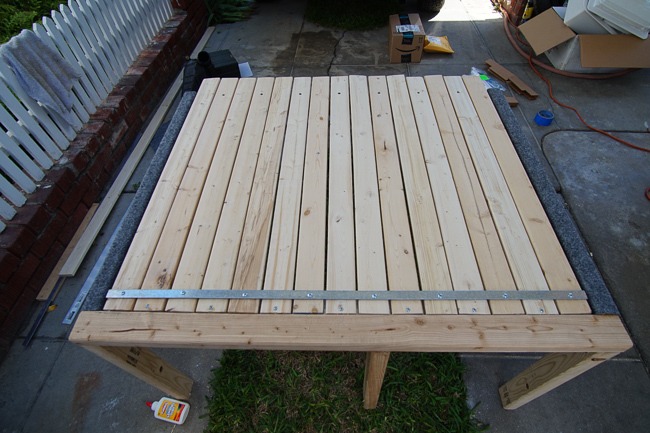 In the back, we drilled a few metal screws into the floor to hold the wood down with metal angle braces which can be found at Home Depot. This kept it all super sturdy both while we drove and while we slept, and it never made a squeak. Good luck with the conversion, let us know if you need any more help! One more question. What type of wood and wait is the thickness that you used to replace the moonroof? 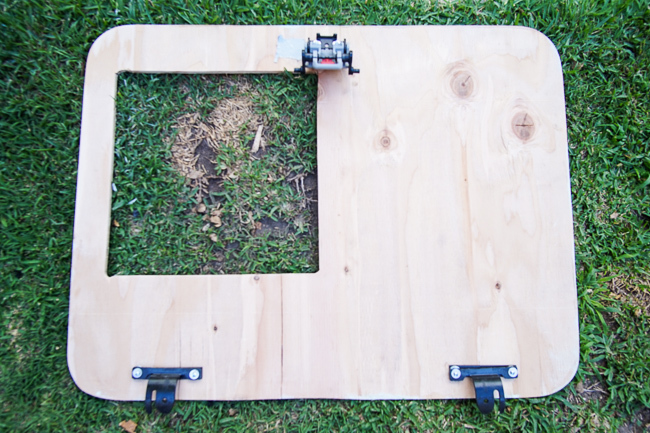 We used 1/2″ plywood and the original brackets to create the moonroof. Then we covered it all in varnish and added sealant around the edges to make it waterproof. Let me know if you have any other questions! This is awesome! You’ve inspired me to convert my wife’s old Saturn Vue instead of retiring it. Thanks! Hi! I have a question, when installing the venting fan system how did you wire it? Also, I read further down that you converted the Honda back to original to resell it. How did you recovert the glass for the sun roof? Thanks! This is great! I’ve been wanting to do something similar to my subaru forester! You wouldn’t happen to have some more in depth information (for a complete newbie!) about installing your house battery and wiring would you? Also learning about how you did the flooring would be so helpful too! Great job!! Incredible! You guys rock, man so cool. I have a 2003 element that I built out pretty well. I am about to do the Fan build you did. Question: would you still choose that same model fan or suggest anything different? My idea is to copy you all but instead of wood use Polycarbonite so that it is still clear see through material. Feel free to push back if you think a bad idea. Very Helpful! Thanks for the tips. Nice build! Starting early 2018, I started doing the same thing with my ’03 Element EX (same exact color, too). I’ve had 100-watt solar running to a 100 Ah Renogy battery. I’d love to relocate the battery somewhere and I’ve seen several people — you included — move it to the engine compartment. Did you have to remove the air intake resonator (all the black plastic parts to the far right side under the hood) to accomplish this? Yea, we had to remove all those black plastic pieces of the intake and create a new hole in the filter housing. There is a surprising amount of room in there to fit a second large battery, we fit a group 31 but didn’t have room for anything bigger. Check your battery size to make sure it’s smaller than a group 31 before you start. Also, I didn’t find any prefabbed battery trays that will fit for this so you’ll have to make your own out of sturdy sheet metal. Good luck! What vent cover did you buy for the max fan. Im installing this fan in my HE 2005. Also, can i give u credit for my purchase somehow? We just used the standard vent cover that comes with any of the standard Maxxair fans. The Deluxe versions of the Maxxair fans have bigger covers that are nice to have when it rains but stick out a few more inches and are much more expensive. Either one of them works, just depends on what features you’re after. As for giving us credit, just click on any of our product links on this page and if you buy anything on Amazon within 24 hours, we get a small commission! Glad to hear your SUV conversion into a camper went so well. You guys did an awesome job on the roof top installation. I would also like to recommend a coating of RV Roof Magic. It works great on water leaks and punctures.